The Life in the UK is an English test required to pass for individuals seeking Indefinite Leave to Remain in the UK or naturalization as a British citizen. The test is a 45 min computer-based online test and only available to take at an accredited Life in the UK Test center on behalf of the Home office in the UK (England, Scotland, Wales and Northern Ireland). This site helps you to prepare for the Life in the United Kingdom Test. The need for such test arises from the fact that most applicants for settlement or naturalisation need to show that they have a good knowledge of language and life in the UK. Changes have been made to the syllabus since 25 March 2013 and a new ‘3rd edition of the Life in the United Kingdom handbook: A Guide for New Residents’ is now available. Also due to the recent changes made to Knowledge of Language and Life in the UK (KoLL) from 28th October 2013 it has become even more imperative to pass the Life in UK test in addition to seeking a speaking and listening qualification in English at B1 CEFR or higher qualification level. If a person wishes to make the UK their permanent home and to become a British citizen it is reasonable to expect them to show, amongst other things, that they are committed to learning English and have an understanding of British history, culture and traditions. Mockexam4U can help you regarding this. Simply register for free and avail yourselves the mock tests that would help you gauge your prep level. The Life in the UK English test is a computer based multiple choice tests. It is available through the network of test centres operated by learn direct on behalf of the Home Office. Since 25 March 2013, the test has been based on the official handbook “Life in the United Kingdom: A Guide for New Residents”. The entrants have to answer 24 questions in 45 min. The passing mark is 75%. The test is based on all the chapters of a handbook third edition. Remember that you need to get at least 75% to pass this test. You must also make sure you scan the newspapers to be updates with the current affairs of the nation and be well-equipped to answer GK or country specific questions. If you are taking the Life in the UK test, you must read the official Life in the United Kingdom 3rd Edition handbook. This essential handbook contains all the official learning material for the test and is written in clear, simple language – making it easy to understand. Mockexam4u is an ideal space to test your preparation level for the Life in the UK test. The test is a 45 min computer-based online test available to take at an accredited Life in the UK Test centre on behalf of the Home office in the UK (England, Scotland, Wales and Northern Ireland). Clearing the Life in the UK test without any hurdles is of prime importance as far as achieving a settlement visa goes. Thus we at Mockexam4U have prepared mock exams to just help you with this cause. The sample test in this section are designed to help prepare you for the Life in the UK test. The sample exam comprises of 15 questions that would enable you to assess briefly your understanding of the topics covered in the Life in the UK English exam. The sample test of provides a glimpse of the actual examination questions. Click the image above to check the Life in the UK sample exam. It would give you a sneak peak at what you could expect in the actual English test. 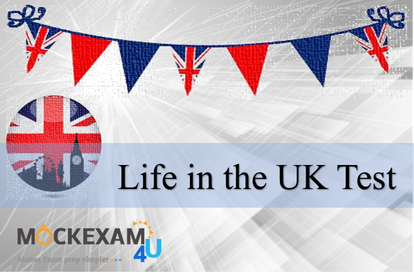 This section is provided to give you an understanding of what to expect at the Official Life in the UK Exam. Our group of certified professionals have carefully designed each of the sample and mock exams to ensure the entire syllabus is covered and you the reader get the utmost benefits. This sample exam encompasses 15 questions and is not time bound. The feedback after every question will tell you the right answer and the corresponding explanation. The sample questions are similar to questions from the current syllabus, to help prepare for the exam. These review questions do not reflect the actual questions you will receive during the Life in The UK exam. They are only meant to supplement your exam experience. It would be prudent to take as many exams as possible to boost confidence and to test your preliminary assessment levels. If you feel you are benefited with the sample exam please do register by following the link below and get a chance to attempt the other 3 Life in the UK Mock exams with 24 questions each for your practice. This online test remains the property of the Mockexam4U. The Life in the UK sample questions and the online tests are not from the official Home Office sample papers and they are created by our organization. These test questions are not to be reproduced or re-sold without our permission. Enjoy the exam whilst free! Each of the exams is vigilantly questioned with each question differing from the other to ensure the entire Life in the UK course material is covered. Also check the Life in the UK Mock Exams. Do give us your precious feedback so that we could cater more easily to your needs. Fancy clearing the Life in the UK Test without any hindrances?…This certificate is appropriate for those working in United Kingdom. It is mainly for anyone who see themselves associated and living in United Kingdom for a longer period of time and who are passionate about eventually becoming a UK citizen. Make sure you have thoroughly read the 3rd edition of the Life in the United Kingdom handbook: A Guide for New Residents. This Mock Exam section comprises of two types of exams namely: The mock exam and the practice exam. The mock exam is time bound with 45 minutes as the end time, whereas the practice exam focuses on testing how much an individual understands from Life in the UK syllabus and is not time bound. The mock exam comprises of similar number of questions in terms of length and time duration, as you can expect on the final day which would be a computer-based examination. The former mock tests your prep from exam point of view and lets you know if you are ready to take the plunge. Whereas the latter practice tests helps you prepare yourself better from an exam and concept viewpoint and give a feedback for every question. Ideal approach for obtaining the maximum benefit from the tests would be that you make sure the course material is thoroughly understood from the Life in the UK examination point of view and you have marked a date on your calendar to give a test. Please select your option from the above mentioned online tests to test your preparation level. The scores would be displayed at the end of the entire test and a feedback email would be sent to you on the registered email address. Assess your preparatory skills with these brain teasers and alleviate exam qualms if any…An Ideal space to test your Life in UK English exam knowledge and make waves for a seamless entry into the Indefinite Leave to Remain visa application. All you would need to do is simply follow the simple link below and register for free in order to access these Mock Tests. This online test remains the property of the Mockexam4U. The Life in the UK sample questions and the online tests are not from the official Home Office sample papers and they are created by our organization. These test questions are not to be reproduced or re-sold without our permission. Enjoy the exam whilst free! Each of the exams is vigilantly questioned with each question differing from the other to ensure the entire Life in the UK course material is covered. Also click this link to attempt the other Life in the UK Sample Exam if you want a preliminary test experience. Do give us your precious feedback so that we could cater more easily to your needs. Now-a-days the individuals wishing to obtain the Indefinite Leave to Remain focus on appearing the Life in the UK test. So how does one make the UK their permanent home and become a British citizen? The Life in the UK application process is simple and requires attention to details. To make life simpler we have enlisted the pointers to be remembered. To begin with we recommend you read the official website of the Home Office. The tests can be booked online by simply following this link. Reach the test centre approximately 45 min before the allocated test time. On arrival at your test centre, provide the ID you registered with. You will not be able to take your test without the id proof and your test fee will not be refunded. Your details such as your full name, date of birth, nationality, country and place of birth, postcode, Home Office reference number (if available), and your purpose for taking the test would be checked. You may also be asked to verbally confirm all of this information without referring to your ID, by test supervisors at the centre. The test supervisor would verbally advise the Test rules and working and will then be logged on to a computer. The test supervisor will tell you when to begin your test and how long you have to complete it. You will first get time to complete a practice test before you begin the Life in the UK Test. Once you are confident about the working of the test, you can start with your test and pass with flying colours. Once all the participants in your centre have completed the test in the stipulated time the results would be handed over to each individual mentioning whether you are ‘PASS’ or ‘FAIL’.